the boarding amount goes down as you complete levels, went down to 45 at L4, and 40 at L5. think of it as a dias shop, that\'s all im sayin. LL, thats is not what I seen, didn\'t matter how much was put into boarding it only gave the base gold, now it may have increased the base amount couldn\'t tell as it seemed random. yes PoA, it is a super casher event, not much for F2P at this point, like tree and capsule started out. Its not random. u get 1:3 ratio ,if u spend more than 1k at a time. well sooner or later they have to. 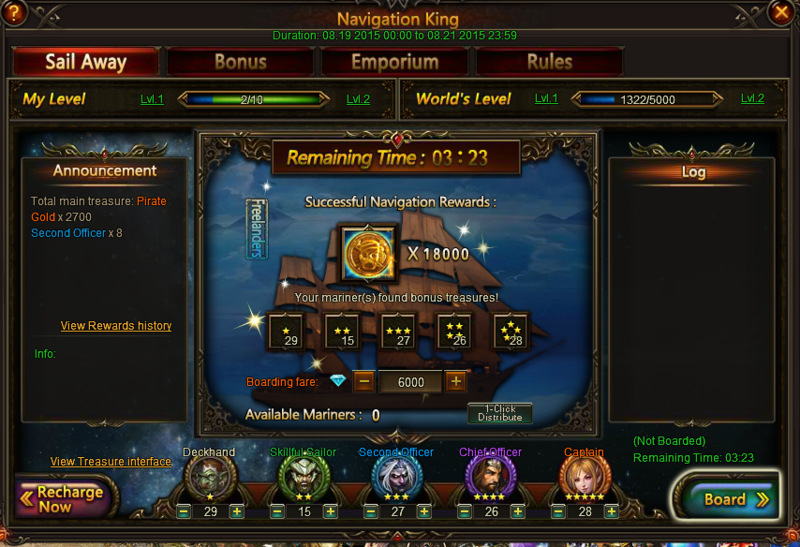 ok, i didn\'t plug that much in and have done more testing, so what i found is each mariner increases the gold in mid, rates are at least for me at my level and with 80% redux. just trying to figure out mechanics for new event and get some insight out, thanks for all help, learning this thing and maximizing output. gold per mariner selected, then you can use KoK ratio to calc for rest. how many times did you board? KoK, and thanks for the ratio, it does work ty, guess it doesn\'t matter, boarding x times doesn\'t seem to affect the payouts. seems all mariner based. 2019-4-20 01:09 GMT+8 , Processed in 0.063332 second(s), 52 queries .